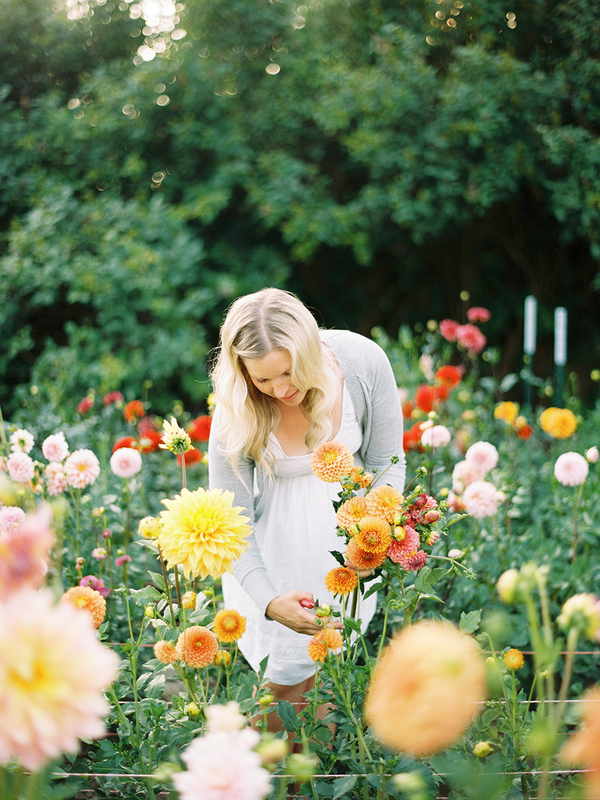 Dawn Cosgrove is a flower farmer in rural Saskatchewan, Canada. She invited photographer Rosie Haberl to her Whistling Prairie Flowers while harvesting her dahlia crop, and they were kind enough to share the beauty with us! We had a few questions for Dawn, and if you've ever wanted to have your own little flower farm, keep reading below! Your farm is stunning. How did it start? Did you grow up growing beautiful things or was this something you discovered later in life? Thank you so much! Honestly I grew up in the garden. Whether it was weeding and pulling radishes in my grandmothers or helping my mom & dad in the garden of my childhood home, if there was a patch of dirt to be found, one could always guarantee they would also find me. I have always loved growing flowers & vegetables so when I married my (now) husband and moved to his farm, there was no question whether or not I'd plant one of my very own! It started innocently enough, in 2012 I found myself tilling up some dirt and planting a wide variety of vegetables as well as cosmos, zinnias, sweet peas, sunflowers and my first ever dahlias. And then over the years my love for growing flowers, combined with finding Floret Flower Farm on Instagram changed everything for me. I knew I wanted to start a flower farm of my own but I wasn't sure how to go about it. We live in a very isolated, rural part of Saskatchewan and I didn't think there would be an interest in locally grown flowers. Then, in the winter of 2017, while my newborn son was in the hospital, my husband & I spent those long, quiet hours daydreaming and I expressed my desire to grow more flowers than ever before and get my flowers out there. That Spring, I planted over 600 dahlias (along with all of the sunflowers, cosmos, zinnias and sweet peas my garden could handle) and was asked to join the local farmers market—my first booth sold out within minutes and I was absolutely floored! From there it kind of snowballed and brought me to where I am today: 3,100 dahlias, 5 flower fields and a desire to bring beautiful, locally grown, sustainable flowers to my little corner of the world. What is the story behind your farm's name? I spent this last winter really contemplating a name for my flower farm. I wanted something with meaning, something with roots. I am very proud to live on the prairies and knew I wanted to reflect that in our name but I wasn't quite sure how to incorporate it. So then I did what I normally do and I went for a walk. I listened to my surroundings and thought about how when the wind blows here, it whistles passed the power poles and throughout our many trees, something I'll admit used to feel isolating and eerie yet now feels nothing but comforting. I thought about how its so peaceful here in the country that as the wild birds fly overhead, you can stop what you are doing and listen to their wings work ferociously to keep up with their bodies - a sound I look forward to every year, As I walked and let my mind wander that evening, I immediately thought of my dad. One of my earliest memories of my dad was during the spring time when the robins returned to our backyard. My dad, a man who was always whistling, would listen for their morning song then whistle it back to them in a game of back & forth. He would whistle and they would always sing back to him - and it made me gigue that my dad could "speak" to the birds in a way that I knew I never could. Fast forward throughout my years growing up under his roof and my dad never stopped whistling, not even when it annoyed the heck out of my teenaged self. It now stands out to me as one of the key characteristics to who my dad truly was as a person. A happy go lucky man of strong roots, a love for the wide open prairies and a true family man through and through. So imagine my surprise all these years later when I met the man I would marry, a Saskatchewan farmer with the most beautiful singing voice I had ever heard. A man who quite literally whistles while he works and doesn't even realize when he's doing it. His whistling sounds are the ties that bind me to this land and connects me to my past. His support and belief in me are all the motivation I need to keep moving forward in this dream of mine and I know that none of this would have happened if it weren't for him and his belief in me. So there you have it, Whistling Prairie Flowers. A name with so much meaning behind it, a home for something I have become incredibly passionate about. Tell us about everything you grow! I know that could be a lot, so what are some standouts, favorites or meaningful blooms you enjoying growing? Oh goodness, I have grown almost everything under the sun these last few years but there will always be my tried and true favorites. My farm can never go without cosmos in every shape and color or long rows of the most fragrant sweet peas. To be honest, I mostly grow the sweet peas for myself. Their beauty and fragrance were a favorite of my paternal grandfather and I grew up admiring them and have never quite gotten over them. Another meaningful bloom of mine are zinnias. They were the first seeds I would plant with my dad every spring and have fast become a favorite here. I grow thousands of them every summer and I'll never get tired of their beauty. If there were such a thing as a spirit flower, I would have to say that mine would be a sunflower. Forever a personal favorite of mine, they grow wild here on our farm and it is definitely one flower I could never go without. Last but not least would be the dahlias. They have quickly climbed the ranks to become the largest produced flower here on our farm with just over 3,100 tubers planted this past spring! They are a lot of work but they are definitely worth it! 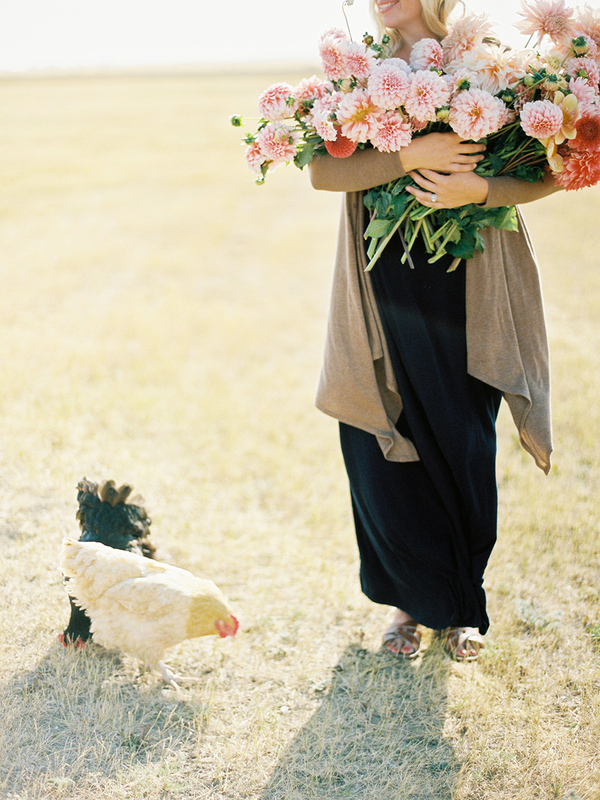 Being a flower farmer seems romantic, although we know not always entirely true. What are some surprising things about your job? Oh goodness yes, being surrounded by gorgeous flowers can definitely be seen as romantic. They photograph so beautifully that its hard to remember just how much work they are to come into fruition! Although we have a relatively short growing season (late April - September) my job never quits. In the Winter I am sourcing seed, planning out fields, ordering supplies etc. I start some of the flowers in January and have quite the growing situation inside the farmhouse that requires daily care from January until May, when most plants can be moved outside. During the growing months I plant everything by hand, then do my best to keep up with the weeds and watering and am always up against mother nature. Our climate is currently in its 2nd year of a drought but before then we would get a damaging hail storm mid season that would often devastate our farm. There are so many things out of our control as a farmer and its all we can do to make it through and keep believing in our goals. After the season has come to an end with a killing frost, there is still so much work to be done before one can actually "rest". There are dahlia tubers to lift, divide and store, landscape fabric to roll up, soil to be amended, cool flowers to plant along with the thousands of tulip bulbs and daffodils, not to mention peony roots that all need to be planted before the snow flies. It's 16-hour days and a whole lot of heartbreak behind those gorgeous blooms—but we do it because we love it and we know that what we're doing will always be worth it. I love that I get to wake up and be surrounded by my flowers. As much work as they can be, their beauty is undeniable. I love that flowers can hold so much meaning to a customer. They invoke special memories that people will share with me and it means so much to me to be able to do that for them. I love the happiness & joy that my flowers bring to others..such a simple thing, isn't it? What advice would you have for someone who dreams of starting their own farm one day who may not be familiar with where to start? Start small. Grow a few of your favorites and grow them well. Trust me, I have learned from my own mistakes of growing too big, too quickly and it was all that I could do to try and keep up.